A satirical yet hard-hitting Gil Fulbright campaign was run in Kentucky last fall, where the “serious” contenders were Mitch McConnell and Allison Grimes. The Honest Gil website features more of these great “campaign spots” — which were actually run in the state during the race. Even the website itself is as good as the fake ads. This is brilliant, ground-breaking stuff, and we salute the Honest Gil campaign and Represent.us, which is using this newest video to springboard a very interesting, ambitious and seemingly even workable campaign to pass anti-corruption acts in towns and cites across the country. 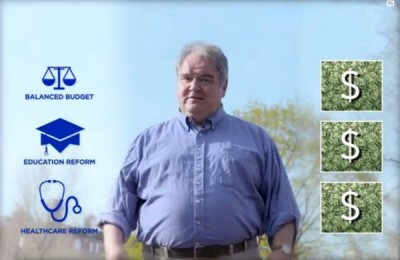 Enjoy this wicked bit mockery, as Honest Gil Fulbright presents that rarest of things: a totally honest campaign ad.